Introducing a brand new collection from Cartoon Folk Artist Miss Mindy. The artist has a very whimsical take on the world and her design aesthetic is shown in these new classic Disney figurines. He's late| He's late, for a very important date| But at least he looks good while he suffers this fate. 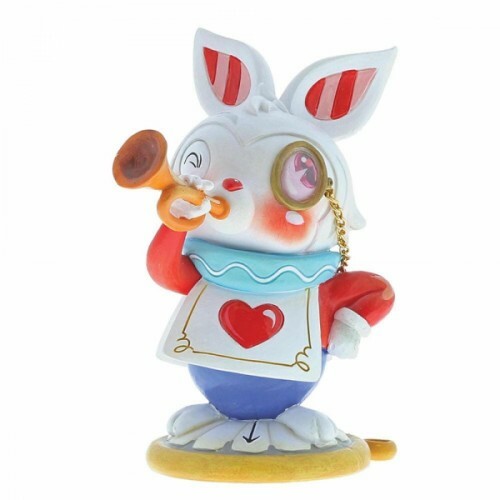 The White Rabbit is featured here working for The Queen of Hearts with a thick aqua ruff collar, monocle, bugle and he also sports the Queen's signature heart symbol on the front of his top. Unique variations should be expected as this product is hand painted. Packed in a branded gift box. Not a toy or children's product. Intended for adults only. Approx 10cm H x 6cm W x 8cm D.